If you have a business in the Haitian community or if you plan to open a business in the Haitian community, there is something very important you need to know. A Name is a very important thing! A name can make or kill a business! Name all your products appropriately. Stop using the same product name that everyone else is using. Why do Haitians still use the basic ingredient name that makes up a product to name the product? The name makes it sound little, it makes it sound simple, it makes it plain. That's is probably why and Haitian Restaurant is a "Plain" Haitian business that will never be categorized as "Fancy" as long as they keep serving "DIRI KOLE". Somebody needs to give "DIRI KOLE" a dish birth certificate and a legitimate name. and for your information, DIRI KOLE is not even a dish, it is a category if dishes. because the names specifically defines the ingredients in the product, we are then limited to creating products that we can describe. In other words, there is no room for creativity. Either you sell "diri Blanc" or your sell "diri kole"
In the mean time, some American restaurant businesses have cornered the American market just with a name. We can do that too! Anyone can make a Hamburger and sell it but guess what? If you want a Big Mac, you have to go to McDonald's. If you want a Whopper, you have to go to Burger King. They are both hamburgers but they not the same. What if they called it the McDonald's hamburger? This is what you call branding. You take something that anyone can make, you give it your own taste, your own flavor, but most importantly you have to give it your own name. Why does your restaurant sell "diri kole" and "diri blan" when your customer can buy it anywhere? If you give it a general name, why should they come back to your restaurant to buy more if it? All you have to do is tell me the make and model and I will know exactly what you are talking about. 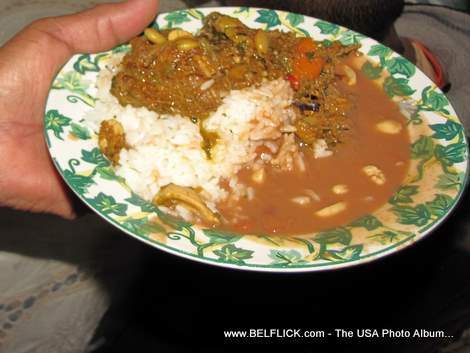 What is your favorite Haitian dish? Good luck explaining that to me! Hi Obed you make a good point too but 2 spelling errors tought and appriciate the correct spelling tHought and apprEciate. Woodring I've always wondered about these same points you make. Hopefully business owners will read this and take it as constructive critcism. I understand you want some change in our people that's a good thing but you forget something, most of these people, if not all of them, did not receive a training on how to be a chef they just have a so call business. In order to name the dish you have to be creative, have some people try the sample, evaluate the critics and make necessary corection then you can put yor signature in it, but like I said "diri kole, diri blanc, ect they don't care about anything but to make a few bocks quick. I highly disagree wit the writer of this article because it not only makes your people sound bad but it also makes the food sound bad. I don't understand why Haitians always like to knock another Haitians hustle. My name is Eline age 14 and I am a Haitian american, I think there should be changes in how people critize us. After all we a re the one's who fought for our freedom first and had all the other caribbean nations following us to their independence. I also think that there is a great number of Haitians who regret being Haitians and I think that should stop. We should learn to help each other and trust each other. My name is Eline age 14 and I am a Haitian american, I think there should be changes in how people critize us. After all we a re the one's who fought for our freedom first and had all the other cariddiean nations following us to their independence. I believe you are right on the money regarding the naming conventions of our foods. For the longest time I felt that Haitians underscore the value of their own cuisine. Nevertheless, I will input my opinion into this matter. thank you for bringing the mistakes to my attention. Because I am the one editing my own articles, that makes it hard to make corrections. you tend to read what you thought you said instead of what's in the paper. hello woodring! i like your articles. two spelling errors plane and explane. the correct spelling is PLAIN and EXPLAIN.